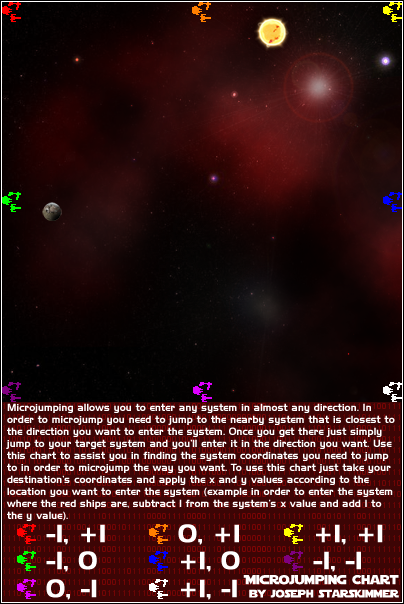 Microjumping allows a player to enter any system from hyperspace in almost any general direction they need. It is extremely useful in shaving off travel time on trips and is very simple to do. In order to microjump you need to jump to the nearby system that is closest to the direction you want to enter the target system. Once you get there just simply jump to your target system and you'll enter it in the direction you want. Let's say your destination is the Coruscant system (-15, 88); if you want to enter Coruscant in the northwest corner fly to the deep space system (-16, 89). Once you arrive there just fly to Coruscant and you're sure to arrive in the northwest corner. IMPORTANT TIP: Do NOT abort a hyperspace jump while attempting to microjump unless you are absolutely sure that there are no suns, planets or black holes on your route. Do NOT abort a hyperspace jump started from within a system; if you have compelling reasons to do so, wait enough time to be sure you left the system. The chart below helps you in finding the system coordinates you need to jump to in order to microjump the way you want. To use this chart just take your destination's coordinates and apply the x and y values according to the location you want to enter the system (example in order to enter the system where the red ships are, subtract 1 from the system's x value and add 1 to the y value).